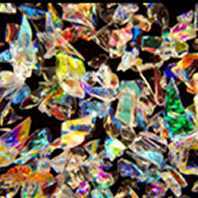 Dichroic frit from CBS is truly premium quality. 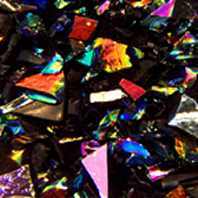 Their dichroic frit is NOT made by grinding up scrap sheet glass. 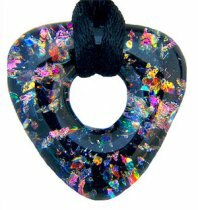 Making frit from scrap gives you a dichroic coating on only one small facet of a frit particle. CBS takes frit, spreads it on a tray and carefully coats the particles on many sides giving a much more brilliant effect. 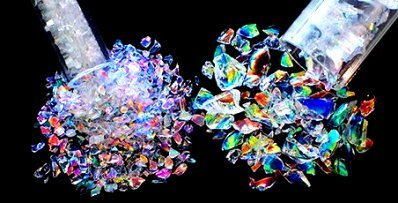 Dichroic Frit - particles are roughly the same size as COARSE frits. Stocked in black and clear frits with a variety of coatings available. Shown on right in photo above. Frits are sold in 2 oz tubes (approx 8½" long and 3/4" diameter). For those in need of specific coating colors on frit, we can special order 2 oz tubes for you. 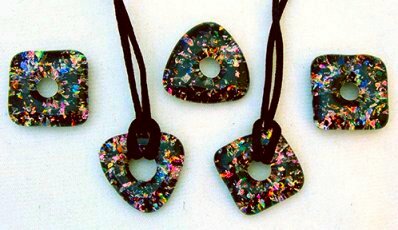 Dichroic Frit Flakes are used in these cast pendants. 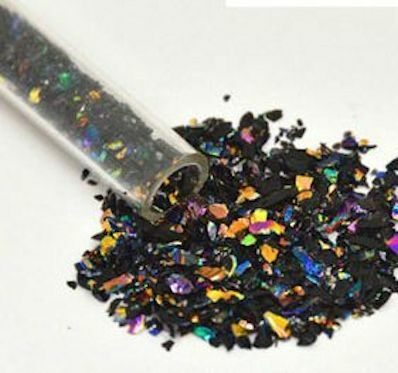 Rainbow 1 coating on medium clear frit flakes.